If Hilton is your choice of hotels an increased signup offer is now out for a limited time. Offers like these don’t come around too often, and this is the second time ever that they’ve offered something like this. Hilton’s American Express Surpass credit card is currently offering 100,000 Points plus a free night each anniversary year for $3000 in spending within three months. The Hilton Surpass card offers 12 HHonors poins per dollar on Hilton purchases, 6 points per doller on restaurants, supermarkets, and gas stations, as well as 3 points per dollor on everything else. Being a card member gives you complementry Gold status with the hotel chain and if you spend $40,000 or more per year you’ll be upgraded to Diamond status which is rewarding if you’re a frequenter at Hilton properties. This is one of the only premium cards that comes with access to Priority Pass getting you into most airport lounges, except like most ultra premium cards you don’t get free guests. 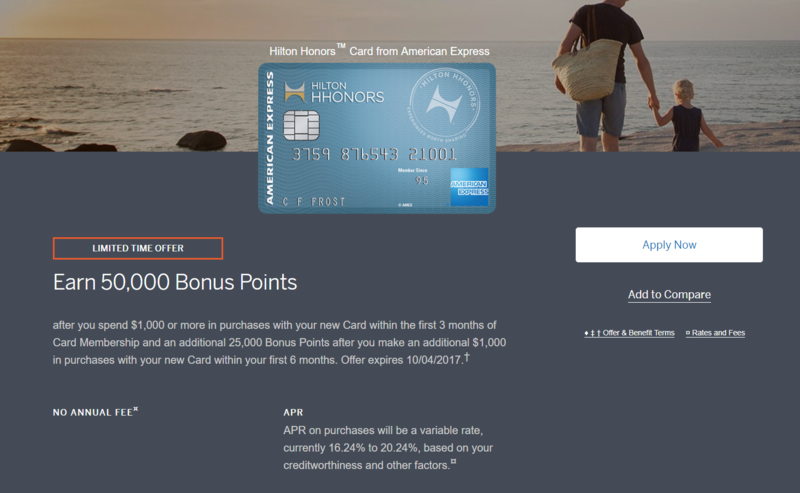 Hilton’s lower end card, the Hilton Honors card also has an increased signup bonus of 50,000 points after $1000 spend and an additional 25,000 points after $1000 spend in 6 months. Unfortunatly this card doesn’t give you automatic Gold status, which you can get for $20,000 spend during the year. If you’re a frequent Hilton guest the Surpass is a great card to get, offering Gold status free breakfast, and upgrades. 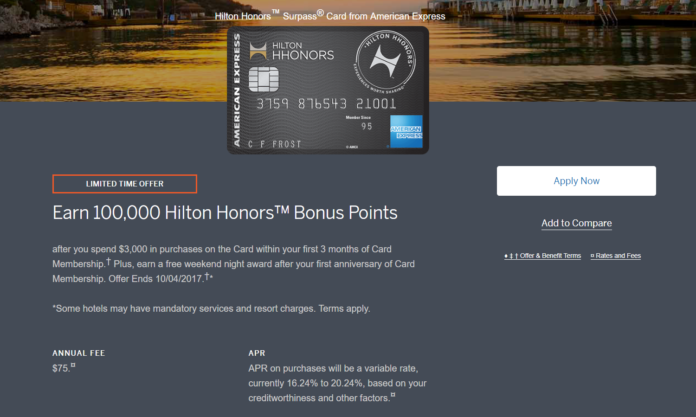 While this is the second time we’ve ever seen this offer it might popup more frequently now that American Express is the exclusive issuer of Hilton credit cards after Citi lost their potfolio of Hilton cards.